A federally-funded grant program created by University of Wyoming (UWyo) faculty that promotes STEM careers has wrapped up its first round of training teachers from various schools across Wyoming and New Hampshire. RAMPED (robotics, applied mathematics, physics and engineering design) is a professional development program funded by the Wyoming Department of Education, through the U.S. Department of Education’s Math and Science Partnerships grant. The three-year program involves at least 25 teachers each year experiencing a 10-day summer institute that takes place on the UWyo campus. In the spring, the teachers will attend six days of follow-up training in the Natrona County School District (NCSD), a major partner in the program. 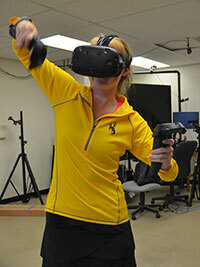 Teachers tested virtual reality equipment through RAMPED. Source: University of Wyoming News. Andrea Burrows, assistant professor of secondary education at UWyo College of Education, played a central role in creating the program. “RAMPED provides teachers professional development to enable six active-learning projects revolving around robotics, applied mathematics, physics and engineering design,” Burrows said in a news release from UWyo. To view the curriculum developed by the teachers, or to learn more about the program, visit the RAMPED site.